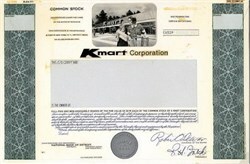 Kmart Corporation Unique Production File with Artwork, Models, Specimen and Proofs, MI. 1977. 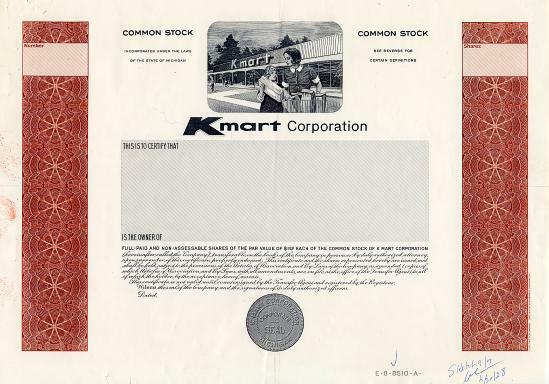 3 different certificates, original artwork of vignette and production material used in the design of the Kmart stock certificate. 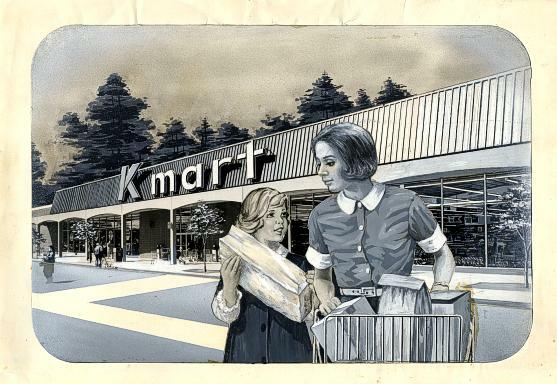 All have vignette of woman shoppping with daughter with ""Kmart"" store in background. 1) Unique Approval model or mockup for ""Odd shs"" of Common Stock in blue. 2) Proof of previous model of an ""Odd shs, common stock in brown printed on white paper with additional proof vignette of title, text and corporate seal. 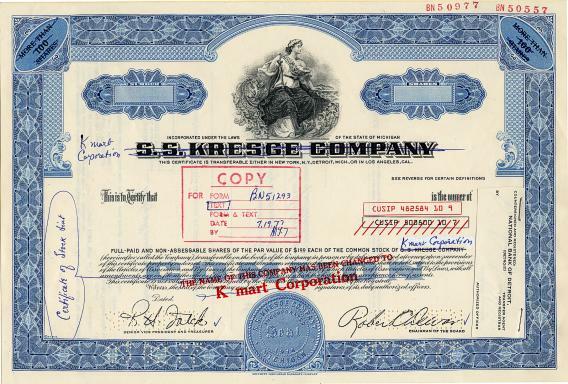 3) Specimen stock certificate of predecessor company ""S.S. Kresge Company"", odd shs, blue Certificate has been overprinted in red ""The Name of This Corporation Has Been Changed to Kmart Corporation"". 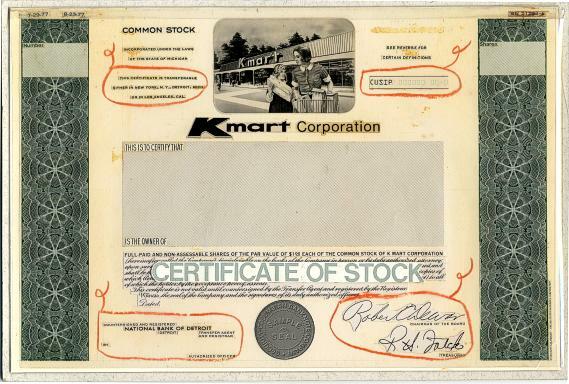 This transition certificate has been used as a preliminary model and has the title crossed out and ""Kmart Corporation"" written in as well as a few other minor changes. 4) Original hand painted artwork, 11.5 by 8 inches, of vignette of woman and daughter with ""Kmart"" in background. A mounted reduced sized photograph of vignette is also included as well as miscellaneous correspondence and production material. Unique and interesting production file. Presently Kmart is part of Sear's Holding Company. Kmart is a chain of department stores in the United States, Puerto Rico and Guam. The chain merged with Sears in 2005, creating the Sears Holdings Corporation. Kmart also exists in Australia and New Zealand as Kmart Australia, although it now shares no current relation with the American stores except in name after US equity in the Australian business was purchased in the late 1970s. The company's business model makes it a competitor to Wal-Mart and Target. The first Kmart store opened in 1962 in Garden City, Michigan; this store is still in operation to this day. (Also in 1962, three chains that would soon become Kmart competitors unveiled their first stores: Target, Wal-Mart and Woolco.) A total of eighteen Kmart stores opened that year. Kmart Foods, a now defunct chain of Kmart supermarkets, opened in that same decade. Kmart's world headquarters was located in Troy, Michigan in a sprawling complex which, since Kmart's relocation to Illinois, has been slated for demolition. Kmart became known for its "Blue Light Specials." They occurred at surprise moments when a store worker would light up a mobile police light and offer a discount in a specific department of the store. The phrase "attention Kmart shoppers" also entered into the American pop psyche. During the 1970s, Kmart put a number of competing retailers out of business. 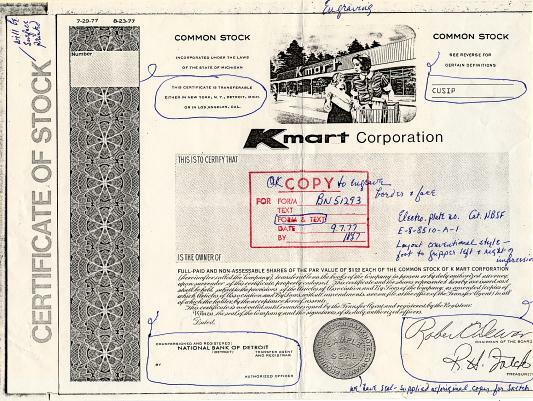 In 1977, S. S. Kresge Corporation changed its name to Kmart Corporation. In 1987, the Kmart Corporation sold its remaining Kresge and Jupiter stores in the United States to McCrory Stores. Canadian Kresge stores continued to operate until 1994. The original Kmart logo that was used from 1962 to 1990. An updated version of the logo is still used in Kmart Australia with the word "mart" done in italics.During the 1980s, the company's fortunes began to change; many of Kmart's stores were considered to be outdated and in decaying condition. In the late-1980s and into the 1990s, the corporate office shifted much of its focus from the Kmart stores into other companies it had acquired or created, such as The Sports Authority, Builders Square, and Waldenbooks. In 1990, in an effort to change their image, Kmart introduced a new logo (dropping the old-style italic "K" with a turquoise "mart", created in the early-1970s), and renovated many stores. However, most stores were not re-modeled until the mid-1990s, and some have not been completely renovated to this day. This logo was replaced in 2004 with the current logo. In the early 1990s, Kmart tried to reinvent itself by using the short lived Today's Kmart name. The company also began to offer exclusive merchandise by Martha Stewart, Kathy Ireland, and Jaclyn Smith. Other recognizable brands included Sesame Street and Disney. Rosie O'Donnell and Penny Marshall were among the company's most-recognized spokespersons. The Kmart logo that was used from 1991 to 2004. Kmart opened its first 147,000 square foot Super Kmart, in 1991 in Medina, Ohio. The second Super Kmart opened in Montrose, Ohio, soon thereafter. Kmart also opened the first Big Kmart in Chicago, Illinois, on April 23, 1997. Many Kmart stores were converted to the Super Kmart concept but most were converted to the Big Kmart concept. The Big Kmart logo was used on many of the stores from 1997 to 2004. Blue Light Special and 1993 Closures The original Blue Light Special had disappeared in 1991, due to changing consumer habits and misuse by individual stores (according to the company's official explanation). The company later brought back the Blue Light Special in the early-2000s, but within a few weeks, the program was scrapped. In 1993, Kmart closed 110 stores. Unlike its competitors Wal-Mart and Target, it failed to invest in computer technology to manage its supply chain. Furthermore, Kmart maintained a high dividend, which reduced the amount of money available for improving its stores. Many business analysts also faulted the corporation for failing to create a coherent brand image. In 2001, the stock scandal involving Martha Stewart tarnished the corporation's image. In addition, Kmart attempted to compete against Wal-Mart on price by introducing the "Blue Light Always" campaign, which revamped the original blue light concept for lower prices in general. In August 2001, Target sued Kmart for false advertising; Target claimed that its "Dare to Compare" campaign routinely misstated both Kmart's and Target's prices. Two days after the terror attacks of September 11, 2001, Kmart stopped all sales of guns and ammunition, citing their concern for the safety of their customers. Numerous Kmart stores have since returned to selling shotguns and other hunting related firearms and ammunition. On January 22, 2002, Kmart filed for Chapter 11 bankruptcy protection; led into the bankruptcy by its then chairman Chuck Conaway and president Mark Schwartz. Conaway, who had success building up the CVS Corporation, had accepted an offer to take the helm at Kmart, along with a loan of some $5 million. Similar to the Enron scandal, Conaway and Schwartz were accused of misleading shareholders and other company officials of the company's financial crisis, while they were allegedly making millions and allegedly spending the company's money on airplanes, houses, boats and other luxuries. At a conference for Kmart employees January 22, Conaway accepted "full blame" for the financial disaster. As Kmart emerged from bankruptcy, Conaway was forced to step down and was asked to pay back all the loans he had taken. After dismissing Conaway and Schwartz, Kmart closed more than 300 stores in the United States and laid off around 34,000 workers as part of a restructuring. On May 6, 2003, Kmart officially emerged from bankruptcy protection as the Kmart Holdings Corporation and on June 10, 2003, it began trading on the NASDAQ as "KMRT." Kmart introduced five prototype stores with a new logo, layout and color scheme (lime green and gray) with one in White Lake, Michigan, and four in Peoria, Illinois, and one in Washington, Illinois (which is still a lime-green store). The new layout was touted as having wider aisles, improved selection and lighting. However, Kmart could not afford a full-scale rollout. The lime green prototype was abandoned for the new Kmart "orange" concept that rolled out at nine test stores throughout the United States. On November 17, 2004, Kmart announced its intention to purchase Sears, Roebuck and Company. As a part of the merger, the Kmart Holdings Corporation would change its name to Sears Holdings Corporation. The new corporation announced that it would continue to operate stores under both the Sears and Kmart brands. The exterior of a typical Big Kmart discount store in Ontario, Oregon.Kmart is a chain of discount department stores that are usually free-standing or located in strip malls. They carry electronics, music, movies, bedding, hardware, sporting goods, clothing, toys, jewelry, office supplies, health and beauty products, home d�cor, and a limited selection of food items. Many stores also have a garden center, a pharmacy, and usually have a K-Cafe or Little Caesars Pizza station. Kmart stores range from 80,000 to 110,000 square feet (7,400 to 10,200 m�). Many of these stores were converted into Super Kmart, and most of them were converted into Big Kmart. Big Kmart is a chain of discount department stores that carry everything a regular Kmart carries, but with an emphasis on home d�cor, children's clothing, and more food items. Big Kmart stores range from 84,000 to 120,000 square feet (7,800 to 11,100 m�). Big Kmart stores also feature a garden center, a pharmacy, and usually have a K-Cafe or Little Caesars Pizza station. Since the merger with Sears, many have been converted back to regular Kmarts. Super Kmart is a chain of hypermarkets that carry everything a regular Kmart carries, but has a full line of groceries. Super Kmart stores range from 140,000 to 190,000 square feet (13,000 to 17,700 m�). These stores are also known as Super Kmart Center. Super Kmart stores also feature a garden center, a video rental store, a branch from a local bank, a pharmacy, and usually have a K-Cafe or Little Caesars Pizza station. Several also include Kmart Express gas stations. Fewer than 60 Super Kmarts are still open, with most having been closed during the two rounds of closures during 2002 and 2003. Some of the surviving Super Kmarts were those in regions without a strong Wal-Mart presence, including Ohio and Michigan. A typical Super Kmart sells around 30 million dollars of merchandise during one fiscal year. While the concept was introduced in 1991, it was very similar to Kmart Foods.Kmart Foods was a grocery store chain founded in 1962. Most Kmart Foods were together with Kmart stores. The chain was discontinued in the 1970s, but re-introduced in 1991 with Kmart's launch of their Super Kmart concept. Builders Square was a big box home improvement chain of stores. It was sold to Hechinger in 1997, who closed all the Builders Square stores in 1999. Borders Books is a chain of book stores acquired by in 1992. In 1994, Borders merged with the Kmart chain Waldenbooks to form Borders-Walden Group and was sold off in 1995. OfficeMax is a chain selling office supplies and office furniture which was acquired in 1991, and sold off in 1995. Waldenbooks is a chain of mall book stores which was acquired in 1984. In 1994, Kmart chain Borders merged with Waldenbooks to form Borders-Walden Group, and was sold off in 1995. PACE Membership Warehouse was Kmart's wholesale club brand, until the chain was purchased by Wal-Mart. In 1993, Wal-Mart converted most of the stores into their Sam's Club brand, and sold others to chains such as Bradlees. PayLess Drugs was a chain of drug stores acquired by Kmart until it was sold to TCH Corporation in 1994. The resulting entity, Thrifty PayLess was acquired by Rite Aid in 1996, which converted all of the PayLess and Thrifty stores into Rite Aid stores in 1999. The Sports Authority is a chain of sporting goods stores which was acquired in 1990, and sold off in 1995. American Fare was a chain of hypermarkets that first opened in January 1989. American Fare was a joint venture between Kmart (which owned 51 percent), and Birmingham, Alabama-based Bruno's Supermarkets. The first store, near Atlanta, Georgia, was 244,000 square feet (larger than most Wal-Mart Supercenters by more than 55,000 square feet). American Fare�s 244,000-square-feet of retail space included 74,550-square-feet of groceries, 104,000-square-feet of general merchandise, and 35,000 square feet of clothing (including apparel, footwear, and accessories). A �mall-like� area in the front of the store housed a music and video store, a food court, bank, hair salon, pharmacy and a card store. Charlotte, North Carolina was home to the second American Fare, which opened in late 1989 with only 160,000-square-feet of retail space. A third and final store opened in Jackson, Mississippi. In June 1992, Bruno's Supermarkets announced that its partnership with the Kmart Corporation was being terminated, and that Kmart would absorb ownership of the three stores. However, the stores were closed in the mid-1990s. The American Fare brand is currently used on some of Kmart's store brand consumable products.